It’s weird to leave Orlando right now. I feel torn, but also somewhat relieved. It has been surreal. An Orange County official said that we have been preparing for this our whole life. No. No, we haven’t; I hope we haven’t been. If you could be prepared and still 49 murdered, that is not very prepared. Prepared? Senator Rubio said it was Orlando’s “turn”. I have hope that that is not the mentality of other American cities and townships. Just waiting for their “turn” in tragedy. If it was Orlando’s turn, then it means this is the reality we have accepted. Mass shootings as an acceptable norm. Accepted? Expected? And sadly, I was shocked that I was suprised. Of course this could happen in Orlando. This could happen anywhere. Orlandoans gather on the lawn of the Dr. Phillips Center for the Performing Arts in downtown Orlando a few nights after the Pulse shooting. Even as we were leaving Orlando, we were already seeing how everyone was rallying together, holding onto love, and rejecting fear. 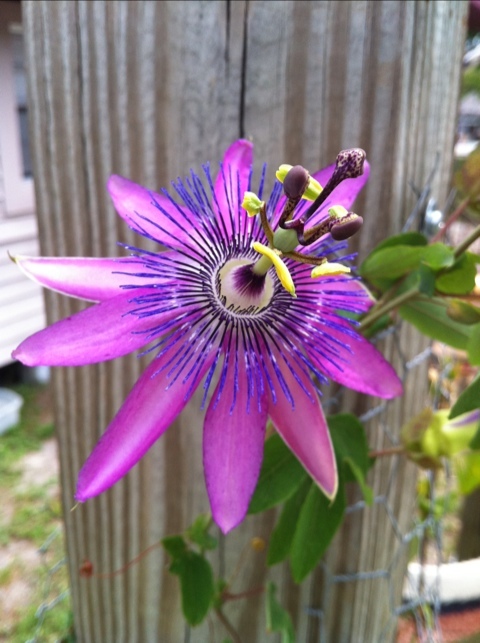 Last week a Now This video of Orlando’s Fleet farming went viral. Such praise for the city and it’s young, ingenious citizens. I was and am so proud of my friends. Then Friday evening, a rising musical star from the Voice was murdered at a place I know and have been. The Plaza Live. My friends went to a pop-up church there for a few years. It’s parking lot hosted the Corridor Project a few years back. I know it and now the world knows it in a very tainted way. Murder. Sunday morning I hopped out of the shower and Nathan told me 20 people were dead and 53 injured at a gay night club in Orlando. Which one? Which one? Which one? Over and over again. Panic setting in. My friends go to gay clubs all of the time. Pulse. Revolution. Parliament House. Pulse. It was Pulse. I was having trouble getting breath. Breathe. Breathe. They don’t seem to go to Pulse. It was Latin Night. Most of my friends are not Latinos. Some are. Check in. Check in. Check in. Why aren’t they all checking in? But they all did. Over the next 12 hours. All of them did. All of my derby girls and guys. All of our friends in the arts and acting community. My friends are safe. But we are not okay. 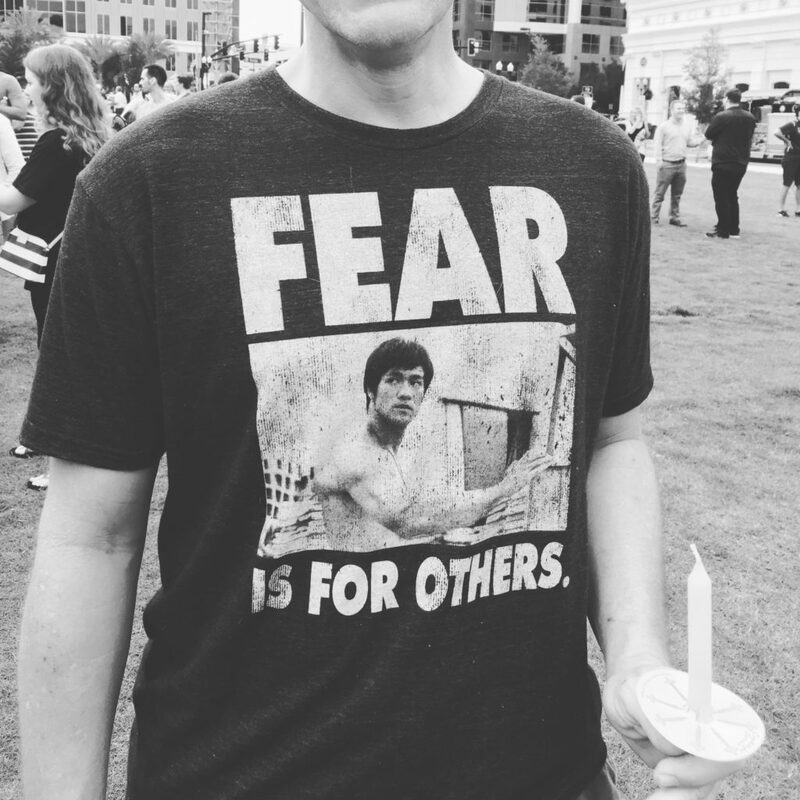 We are safe. But not okay. A former derbymate is a bartender at Pulse. Her friends are dead. A former derbymate’s brother was part of the SWAT team and his helmet was the one that was shot. It saved his life. Some of our friends first met at Pulse. It is right down the street from the hospital that I went to for treatment. I’ve driven by Pulse hundreds of times. I’ve never been in. It’s not my scene, but it is a mile from our first house. It is 3 miles from our current house. It is surreal. But of course it is very real. 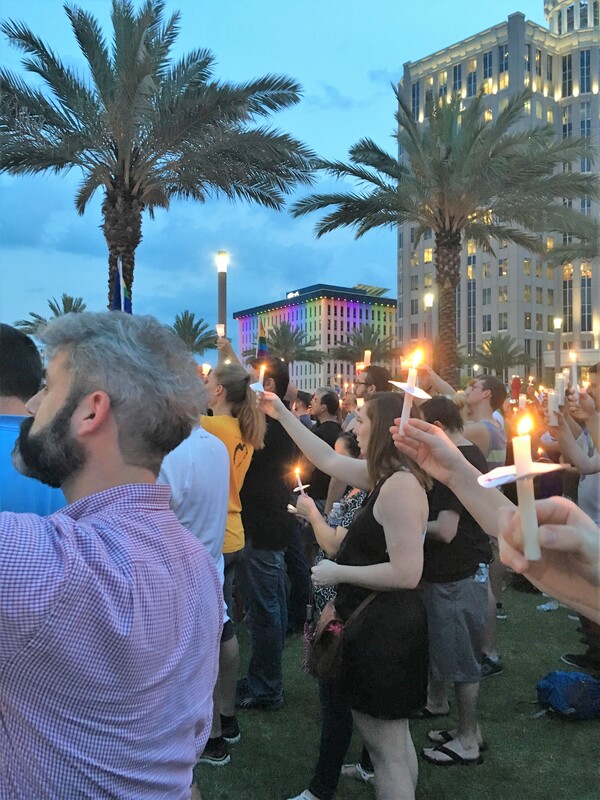 Many gather on the lawn of the Dr. Phillips Center for the Performing Arts in downtown Orlando for a vigil a few nights after the Pulse shooting. And so we’re going to be gone during much of the mourning and aftermath. We’re bring love from Orlando on the road, but it is a strange thing not to be there. It is a hard way to start a trip. But here we are. We’re excited to meet people all of the states and the world. We’re excited to see things from a different perspective. We’re looking forward to adventures, good food, travel days (good and bad), beautiful views, and people. This is our first major trip since 2013 when we were in Paris for nearly a month. The past few summers we’ve had other adventures to attend to like chemo and recovering from surgery. So yeah, we’re excited to get out and do something we’ve never done before. 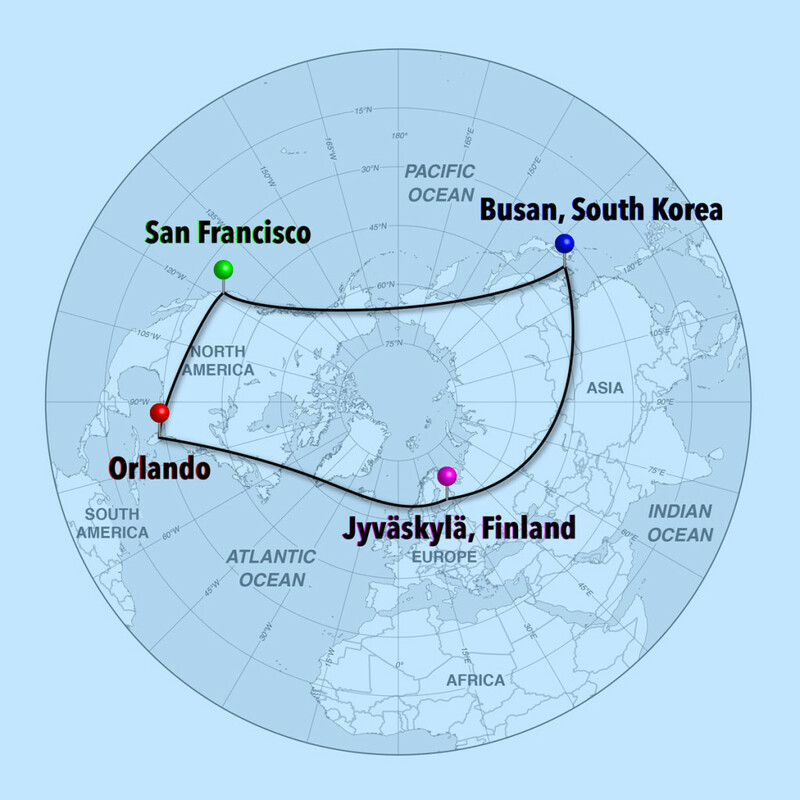 I’ve never been to any of the places on our list: Rockford (lllinois), Madison, San Francisco, Busan (South Korea), Seoul, Kathmandu (Nepal), Doha (Qatar) for a 2 hour layover, London, Oslo, Trondheim (Norway), Helsinki, Jyväskylä (Finland), and Iceland. 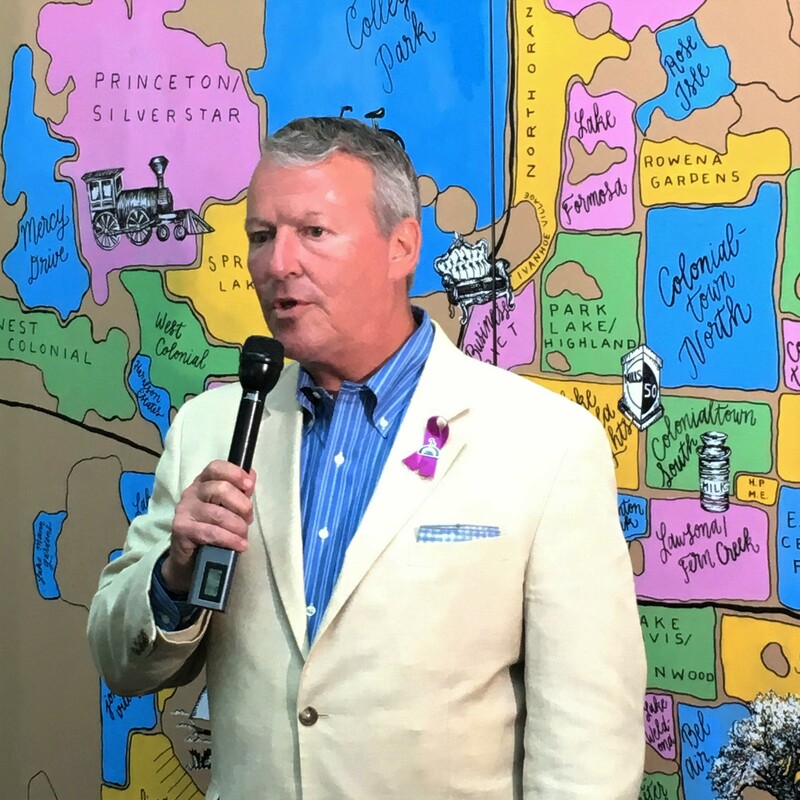 Orlando Mayor Buddy Dyer addresses a crowd gathered at the Downtown Orlando Info Center a few days after the Pulse shooting. A group of local businesses produced memorial t-shirts and screen prints as a fundraiser for the OneOrlando fund. Nate was involved in the creation of the Orlando neighborhoods map behind the mayor. Tears for our city, its people and its visitors this morning. Tears for the brokenness of the world. Tears for violence and hatred. 50 dead, 50. One for each state. One for each star on the the flag. 53 others injured. But 50 dead. 50. 50. Such grief. I don’t know if my friends are all safe. I hope you are. But we will all know someone. We stand with Paris, Brussels, San Bernardino, Baghdad, and on and on and on. If you’re reading this, I love you. It is an ante dote to hate. I don’t have answers to all the bigger questions. But I love you. 50 dead. 53 injured. I’m praying for you all. Yesterday was filled with grief and pain. Even as the media took up the story and conversation online shifted to the inevitable subjects – gun control, ISIS, homophobia, mental health, love over hate, faith over fear – I was still feeling just sad and heavy. I think those conversations are important, but the main thing I was left with yesterday was, it’s important to weep and mourn, to grieve. Don’t rush that. The other truth I tried to hold on to was that there is room for everyone to process this in their own way, which might not be my way. There has to be room. We are a diverse city, a diverse country, a diverse world. We will not all process or deal with tragedy in the same way. Towards the end of the day I was feeling more anger and frustration, and just feeling sick at the violence of humanity. The roots of violence go deep. Cain and Abel deep. Violence has been apart of America since the beginning. Violence against indigenous people groups. Violence against Africans. Violence against women. Violence. And our country continues to experience violence. According to the FBI definition of a mass shooting, there have been 133 of them this year along, and we’re only 165 days into the year. And our country continues to perpetuate/utilize violence throughout the world in the form of drone strikes, which are harder to get statistics on. There is so much violence and hatred and evil in the world. It’s still a fluid situation here in Orlando. Not all of the names have been released. Not all of the dead have been identified. I hope our city will continue to come together across its diverse residents and become a place of peace and prosperity. I pray for the families and friends of the victims, for the LGBTQ and Latino and Muslim communities who have been most directly impacted by this tragedy. It feels weird that we are leaving on a round-the-world trip this Thursday morning. 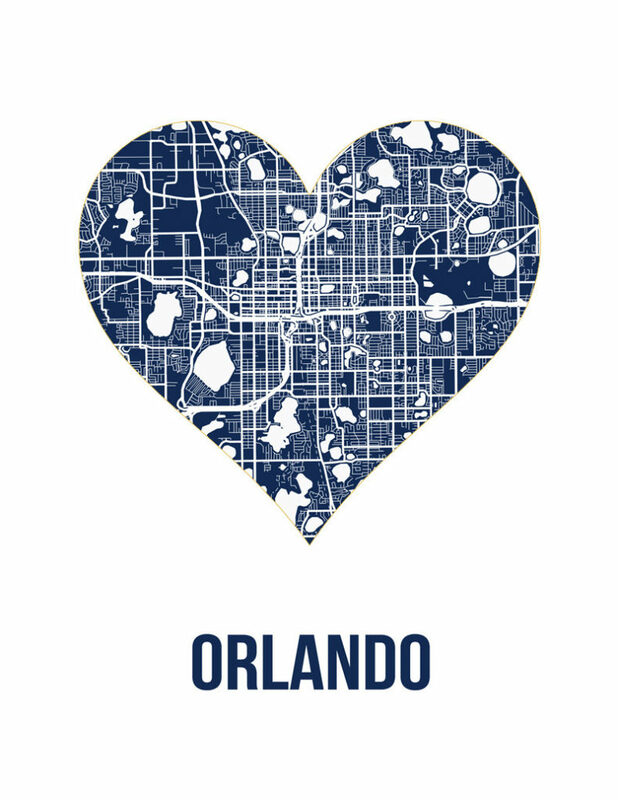 As we travel around the world over the next two months, we will carry the love of Orlando and our love for Orlando.